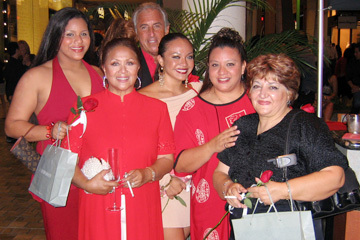 THE GREENS GO RED: Red was the color of choice on Sunday when attorney Michael Green and his wife, Estelle Ortiz Green, second from left, attended "Gala Event," the finale of World Festival 2005 at Ala Moana Center. Granddaughters Ariana Jennings, left, and Brittney Anelaikalani Jennings, daughter Lani Jennings and family friend Soyela Modaressi joined them for the invitation-only celebration of upscale fashion. An eclectic crowd of trend-setters, high rollers and fashion slaves enjoyed several hours of free pupus, progressive music and people-watching. Cole Haan, Dior and Fendi also hosted ultra-private parties during the larger private event. YES, HE IS LANCE RAE: Lance Rae appeared suitably impressed by fashion designer Chelsea Gine's custom-cut T-shirt as they enjoyed the Dior party with Chelsea's mom, Jo Dee Gines, second from left, and Lisa Kass. Chelsea's latest project is a designer line for Paulani Swimwear, and she's flying to Cannes to select the fabrics for it later this month. 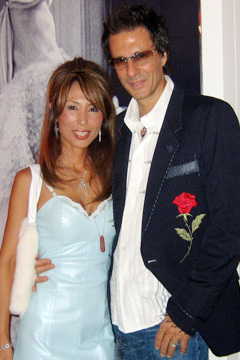 PETER'S NIGHT OUT: Nightclub owner Peter Maharaj enjoyed Fendi's "Garden of Delight Cafe" party with Lynnette Kim. 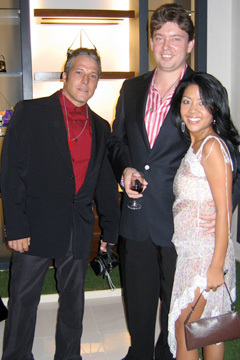 LUCKY FEW: Kyoko and Robert Palma were among those with red dog tags needed for admission to the Dior party. VISITING 'THE GARDEN': Philana Bouvier met Paul Perri, left, and Swavek at the Fendi party. Trellises and strips of live sod gave the upscale store a garden feel for the evening. Perri's daughter, recording artist Jennifer Perri, is on tour with Shaggy. HITTING THE AFTER-PARTY: Fendi's "Garden of Delight Cafe" party continued after the "Gala Event" was over. Myrla Romero, left, Kyle Mitsumori, Joelle Ishi and Jocelyn Cua-Racoma returned for another drink or two before calling it a night.